I know this is the wrong place but those who, like me, cant quite reach the heights of a Daytona just yet cant do any worse than making do with this little beauty in the mean time! What you guys think? Ps I thought my boys Star Wars bed cover was a good setting for this particular model! Congrats. My favourite speedy by far. A couple of strap options below. Such a versatile watch, and a much better fit for me than the pro. I own that one myself...Great watch! Good to see a bit of love for another classic that ain’t always Rolex! 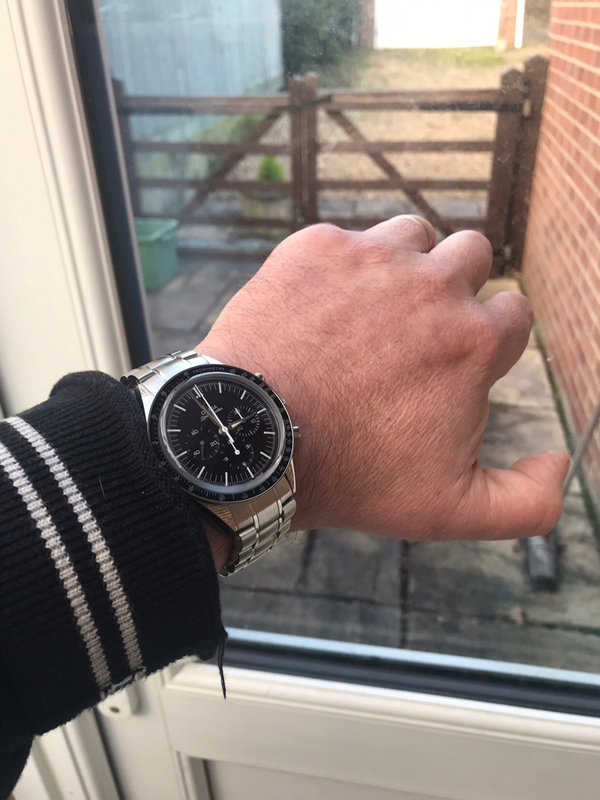 Beautiful, I am another one of the many TRF members who love the Speedmaster. Mine's a 30th Anniversary Apollo XI that I bought back in '99. Great looking piece for sure. The FOIS is a beautiful watch! I had a speedy pro for a while and ended up selling it to find the sub purchase. If I were to get back into a speedy I’d be going for the FOIS. Much nicer watch than a flashy Daytona. Ouch! The Speedmastee FOIS is lovely, as is the Professional. Even if I had a Daytona—and I don’t—I’d still “need” a Sleedmaster Pro. It’s one of those iconic chronographs. Its pound for pound the best watch IMO. I am really enjoying the vintage measurements and it does make me want a vintage Daytona even more now! It is an iconic piece in its own right! And it feels good that I just decided to buy one and just went and bought one within minutes of deciding I wanted it! When was the last time you could do that with a stainless steel Rolex! Love it on leather strap! Nice. I have a ss Daytona and let me tell you, my speedy gets far more wrist time and is infinitely more ledigible and functional. Enjoy a great watch. That FOIS is a beauty!! Congratulations. Looks great on the leather strap and on your wrist. I think that that watch looks really nice. Are this watch's dimensions obviously different to the professional versions, does it wear differently? Congrats! I love that version and have contemplated adding it to my collection. The FOIS is listed as 40mm and the Professional at 42mm but the difference is really just the crown guards adding a few mm. They share a common bezel. The lugs are also shaped differently with the pro having a 20mm gap and the FOIS 19mm like the racing models and some of the previous date automatic (pre co axial) versions. The FOIS is listed as 40mm and the Professional at 42mm but the difference is really just the crown guards adding a few mm. They share a common bezel. The lugsard alsoshaped differently with the pro having a 20mm gap and the FOIS 19mm like the racing models and some of the previous date automatic (pre co axial) versions. To me it takes up quite a lot more real estate on the wrist. When I bought my FOIS recently I tried them on back to back. 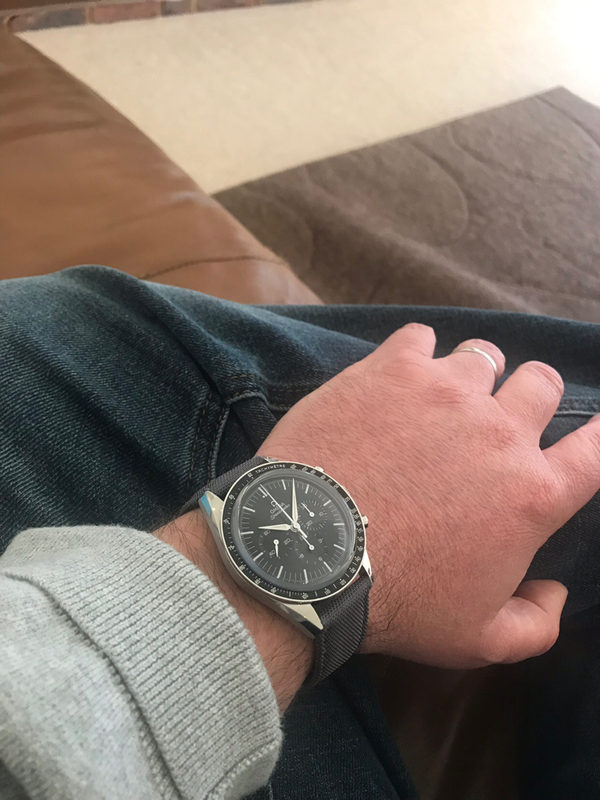 The bracelet on the pro makes it much more chunky, and also I felt the case back of the FOIS sat on my wrist better (no idea if they are different). So I think they wear very differently, but maybe that’s just me. smh. that opening line diminishes this amazing watch. fwiw, I far prefer this over just about any Daytona. and it looks amazing on strap. One day with my Speedy Pro, and any thought of wanting a Daytona as gone. I think I'm going to have to try one of these on. I always used to look at Speedmaster but, one day while visiting Miami, I walked into an Omega Store and saw this beauty for the first time. 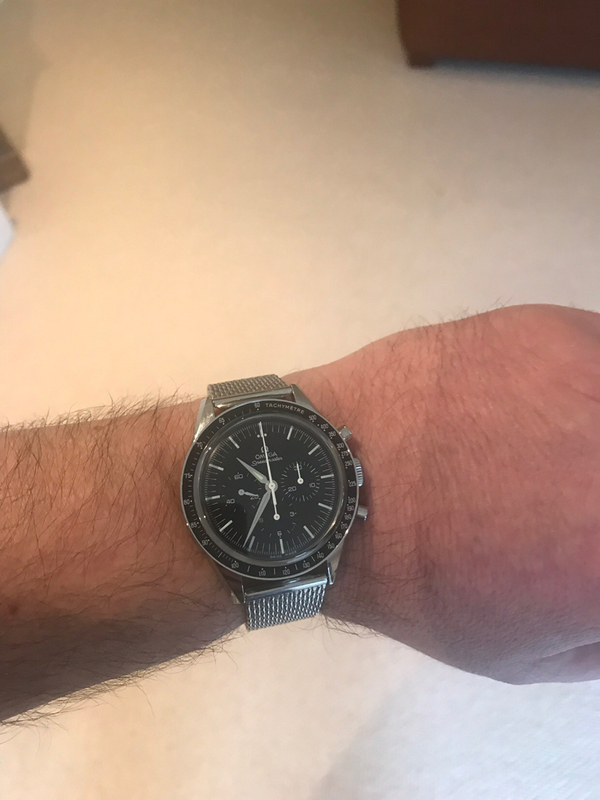 I said to myself “This was the Omega to buy” but sadly, the leather was too hard for my liking. Now I own a speedy pro and it’s a wonderful piece. Great watch! Tough choice between this and the Pro. I ended up with the Pro, but I still look at the FOIS with a certain longing. Well, I have to be honest: I am not a Daytona fan, although I am a huge Rolex fan. I just find this FOIS to be one of the most outstanding chronographs. I just hope you get tons of pleasure out of this beauty. You simply cannot go wrong!